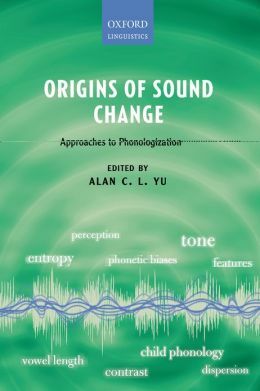 Origins of sound change: Approaches to phonologization. Editor. Oxford: The Oxford University Press. 2013. The Handbook of Phonological Theory, 2nd edition. Co-editing with John Goldsmith and Jason Riggle. Oxford: Blackwell Publishing. 2011. Exemplar-based models in linguistics. Co-edited with Susanne Gahl. Special issue of Linguistic Review 23(3). 2006. “On the nature of the perception-production link: Individual variability in English sibilant-vowel coarticulation.” 2019. Laboratory Phonology: Journal of the Association for Laboratory Phonology, 10(1), 2. DOI: http://doi.org/10.5334/labphon.97. “Perceived masculinity predicts U.S. supreme court outcomes.” (with Daniel Chen and Yosh Halbertsam) 2016, PLOSONE 11(10): e0164324. “The effects of language immersion on the bilingual lexicon: Evidence from Chinese-English bilinguals.” (with Peggy P. K. Mok) 2016, Linguistic Approaches to Bilingualism. “Vowel-dependent variation in Cantonese /s/ from an individual-difference perspective.” 2016, Journal of the Acoustical Society of America 139(4): 1672-1690. “The stability of perceptual compensation for coarticulation within and across individuals. A cross-validation study.” (with Hyunjung Lee). 2014. Journal of the Acoustical Society of America 136(1): 382-388. “Phonetic imitation from an individual-difference perspective: Subjective attitude, personality, and ‘autistic’ traits.” (with Carissa Abrego-Collier and Morgan Sonderegger) 2013, PLOS ONE 8(9): e74746. “Morpheme-like prosodic functions: Evidence from acoustic analysis and computational modeling.” (with F. Liu, Y. Xu, and S. Prom-on) 2013, Journal of Speech Sciences 3: 85-140. “On measuring phonetic precursor robustness: A response to Moreton 2008. 2011, Phonology 28: 491-518. The phonetics of quantity alternation in Washo.” 2008, Journal of Phonetics 36(3):508-520. “Understanding near mergers: The case of morphological tone in Cantonese,” 2007, Phonology 24(1): 187-214. “Quantity, stress, and reduplication in Washo,” 2005, Phonology 22(3): 437-475. “Explaining final obstruent voicing in Lezgian: Phonetics and history,” 2004, Language. 80(1): 73-97. “Infixing with a vengeance: Pingding Mandarin infixation,” 2004, Journal of East Asian Linguistics 13(1): 39-58. “Pluractionality in Chechen,”2003, Natural Language Semantics 11(3): 289-321. “Stress assignment in Tohono O’odham,”2000, Phonology 17 (1): 117-135. Fundamental aspects of perception of f0. With Oliver Niebuhr, Henning Reetz, and Jonathan Barnes. To appear in Carlos Gussenhoven and Aoju Chen. The Oxford Handbook of Language Prosody. Oxford University Press. “The phonetics of sound change.” To appear in Richard D. Janda, Brian D. Joseph, and Barbara S. Vance (eds.) The Handbook of Historical Linguistics, Volume II. “Laryngeal schizophrenia in Washo resonants.” 2018. In Gene Buckley, Thera Crane, and Jeff Good (eds.) Revealing structure. Palo Alto: CSLI. “Individual differences in socio-cognitive processing and the actuation of sound change.” 2013. In Alan C. L. Yu (ed.) 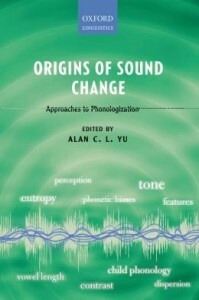 Origins of sound change: Approaches to phonologization. Oxford University Press. 201-227. “Contrast reduction.” 2011. In John Goldsmith, Jason Riggle, and Alan C. L. Yu (eds.) The Handbook of Phonological Theory, 2nd edition. Oxford: Blackwell Publishing. 291-318. “Mergers and neutralization”. 2011. In van Oostendorp, Marc, Colin J. Ewen, Elizabeth Hume and Keren Rice (eds). The Blackwell Companion to Phonology. Blackwell Publishing. 1892-1918. “Tonal effects on perceived vowel duration“. 2010. In Laboratory Phonology 10. Mouton de Gruyter. 151-168. 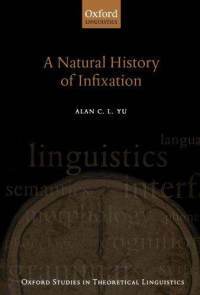 “The phonology-morphology interface from the perspective of infixation.” In Matti Miestamo & Bernhard Wälchli (eds.) New challenges in typology: Broadening the horizons and redefining the foundations. Mouton de Gruyter. 2007. “Morphosyntax of two Turkish subject pronominal paradigms,” (with Jeff Good), ed. by Lorie Heggie & Francisco Ordonez. Perspectives on clitic and agreement affix combinations. John Benjamins. 2005. “Non-segmental conditioning of sibilant variation in American English.” 2018. With Jacob Phillips and Daniel Chen. In Proceedings of Speech Prosody 9. “Perception and production of Cantonese tones by South Asians in Hong Kong.” 2018. With Peggy P. K. Mok and Crystal W. L. Lee. In Proceedings of Speech Prosody 9. “Investigating variation in English vowel-to-vowel coarticulation in a longitudinal phonetic corpus.” 2015. With Carissa Abrego-Collier, Jacob Phillips, Betsy Pillion, and Daniel Chen. Proceedings of the 18th International Congress of the Phonetic Sciences. “Variability in perceived duration: pitch dynamics and vowel quality.” 2014. With Hyunjung Lee and Jackson Lee. In TAL-2014, 41-44. “Copula agreement and the stage-level/individual-level distinction in Washo.” 2011. With Ryan Bochnak and Timothy Grinsell. In Meagan Louie & Alexis Black (eds. ), the UBC Working Papers in Linguistics: Proceedings of the 16th Workshop on the Structure and Constituency in the Languages of the Americas. “Effects of speaker evaluation on phonetic convergence.” 2011. With Carissa Abrego-Collier, Julian Grove, and Morgan Sonderegger. In the Proceedings of the International Congress of the Phonetic Sciences XVII. “Effects of working memory capacity and “autistic” traits on phonotactic effects in speech perception.” 2011. With Julian Grove, Martina Martinovic, and Morgan Sonderegger. In the Proceedings of the International Congress of the Phonetic Sciences XVII. “A typological study of the interaction between level tones and duration.” 2011. With Matthew Faytak. In the Proceedings of the International Congress of the Phonetic Sciences XVII. “A rational account of perceptual compensation for coarticulation.” 2010. With Morgan Sonderegger. In S. Ohlsson & R. Catrambone (eds. ), Proceedings of the 32nd Annual Conference of the Cognitive Science Society. Austin, TX: Cognitive Science Society. 375-380. “Tonal mapping in Cantonese vocative reduplication.” 2010. In the Proceedings of the 35th Annual Meeting of the Berkeley Linguistics Society. Berkeley: Berkeley Linguistics Society. 341-352. “Two patterns of reduplication in Washo.” 2012. In the Proceedings of the 34th Annual Meeting of the Berkeley Linguistics Society. Berkeley: Berkeley Linguistics Society. 365-378. “On iterative infixation.” 2008. In Hannah J. Haynie and Charles B. Chang (eds.) Proceedings of the 26th West Coast Conference on Formal Linguistics. Somerville, MA: Cascadilla Proceedings Project. 516-524. “Tonal phonetic analogy.” 2007. In the Proceedings of the International Congress of the Phonetic Sciences XVI. 1749-1752. “Lexical and phonotactic effects on wordlikeness judgements in Cantonese.” 2007. With James Kirby. In the Proceedings of the International Congress of the Phonetic Sciences XVI. 1389-1392. “Moraic anchoring of f0 in Washo,” 2007. With Justin Murphy. In the Proceedings of the International Congress of the Phonetic Sciences XVI. 1161-1164. “Toward a typology of compensatory reduplication.” 2005. In John Alderete et al. (eds.) Proceedings of the 24th West Coast Conference on Formal Linguistics. Somerville, MA: Cascadilla Proceedings Project. 397-405. “Some methodological issues in phonetic typology research: Cantonese contour tone revisited“, 2003. In Proceedings of the Twenty-Ninth Annual Meeting of the Berkeley Linguistics Society: General Session and Parasession on Phonetic Sources of Phonological Patterns: Synchronic and Diachronic Explanations. 623-634.